This kit will keep even the most avid lego builder happy (and quiet) for hours and at £28 that has got to be worth it. The instructions, as with all Lego is fairly straight forward, although we did have a problem the first time we built this as it is not shown which way round the rocket style section should go. 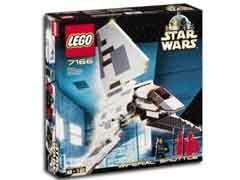 There is a similar problem with the X-Wing Fighter kit, but whereas with that set it is easy to take them off and turn them around, with the Imperial Shuttle set you could find out your little ones have to rebuild a large section of the model. Still, it will keep them quiet a little longer. For some reason ever child we asked to choose a kit decided on this over the X-Wing Fighter. Now, when I was a young lad we wanted to be the good guys. It seems this generation want to be the bad guys! More fun than any child actually deserves. I suggest you buy this for yourself and play with it late at night when the little 'uns have gone to bed. They will only dismantle it and try and make guns out of it, as my son did. I never thought it was possible to have so much fun with a set of plastic bricks. Lego just keeps getting sexier!